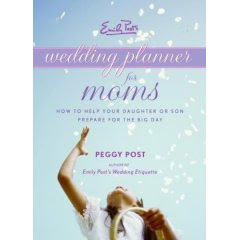 Whether your mom is helping you with your wedding plans a little, REALLY helping you or just driving you crazy - you might want to pick up Emily Post's new book - Wedding Planner for Moms - how to help your daughter or son prepare for the big day. This is a new etiquette primer by Peggy Post. It can answer lots of questions and may help in the relationship you have and want to keep with your mom and/or mother in law to be.